Kong: Skull Island is a 2017 American monster film directed by Jordan Vogt-Roberts and written by Dan Gilroy, Max Borenstein and Derek Connolly, from a story by John Gatins and Gilroy. 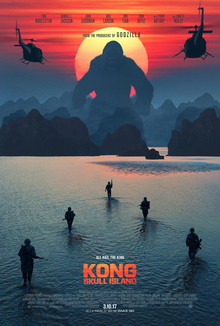 The film is a reboot of the King Kong franchise and serves as the second film in Legendary’s MonsterVerse, following Godzilla. It stars an ensemble cast consisting of Tom Hiddleston, Samuel L. Jackson, John Goodman, Brie Larson, Jing Tian, Toby Kebbell, John Ortiz, Corey Hawkins, Jason Mitchell, Shea Whigham, Thomas Mann, Terry Notary, and John C. Reilly. Another monster movie. It’s definitely B-grade with aspirations to explore the theme between man and beast. Which is the more dangerous ? Tom Hiddleston gets all the action hero poses although John Goodman and John C. Reilly are more entertaining. There are another dozen generic soldiers, scientists and minorities to go down the gullet of the swamp monsters. Fun & entertaining, although forgettable.